has been studied or understood more in terms of history rather than philosophy per se. What constitutes ‘philosophy’ in South Asia is another completely different question which deserves an exquisitely different platform for a candid discussion. The philosophy in South Asian context needs a closer scrutiny at the hands of ‘philosophers’ rather than the ‘historians of philosophy’. In other words we should learn about the past of philosophy in South Asia, understand it ‘today’, and then analyze and assess how and what can we contribute to it. This is as true about the philosophy written in Sanskrit texts in South Asia, as it is about the philosophy written in Persian, Arabic, Kashmiri, Hindi-Urdu, Tamil, and other classical and vernacular languages. Is not the plethora of ideas those were born and developed in South Asia as a part of Islamic culture a component of Indian philosophy ? Those old-school scholars who believe that the Islamic, Christian and other cultures are foreign to Indian culture must shed their pseudo-garb of colonial interpretations of Indian philosophy. If we accept their theory then the Vedic philosophy too should be regarded as foreign to India like Islamic philosophy, because the composers of the Vedas also ‘invaded’ the indigenous people of India and imposed upon them the so called Vedic culture. Or, for instance, since Christianity arrived in South Asia much before Islam did – what about the ideas those developed as a part of Christian culture in South Asia ? This is as true in case of many other smaller religious cultures in South Asia as it is about the vast literatures produced in vernacular languages. Were, for instance, Kabir, Ghalib, Lal Ded, or the creative philosophers writing in South Indian languages not philosophers? Here I will focus on the philosophy of India as discussed in the Sanskrit texts. One of the major reasons for studying ‘Indian philosophy’ as a ‘thing of the past’ is that the Sanskritists in India have studied this philosophy either mostly from philological point of view or simply as knowing about the facts listed in these systems. This, however, does not seem to be the case with the traditional paṇḍit scholarship, where in the majority of the cases as witnessed by me personally, since the tradition is understood as continuing and alive, there is an attempt to make the study of philosophy ‘as the thing of the present’. A critical reflection that evaluates this system engaging with contemporary thinking systems (by contemporary I do not necessarily mean Western philosophy alone) in the Indian sub-continent is what is needed. Is philosophy dead in contemporary South Asia? Are there no contemporary philosophical systems existing in South Asia and if at all there are, how have they evolved from the past and how are they engaging with the present. An attempt to answer such questions will help us in understanding the present of the philosophy in Sanskrit sources or what is sometimes misleadingly called ‘Indian philosophy’. There were, nonetheless, a few exceptional scholars in the 20th century who besides having training in traditional learning were also equally good at modern scholarship. Professor Kanti Chandra Pandey was one such scholar who combined in himself an erudite philosopher and an informed historian. His remarkable work on Abhinavagupta is a testimony to this combined scholarship. His student Professor Navjivan Rastogi who has authored the book in question is another such rare Sanskrit scholar in whom one can see the reflection of his teacher. Rastogi’s book that is written in terse Hindi language (at least that is what I felt, but I may be wrong since Hindi is not my mother tongue) is a collection of various research papers he has written in his long scholarly career of about fourty-five years. The book is not strictly focusing on Abhinavagupta as Pandey’s work is, for instance, but nonetheless it is certainly addressing Abhinavagupta’s system in a very broader sense. Today, unfortunately, where we witness that the ‘critical’ Sanskrit scholarship is rare in India, this book is coming as a welcome-item. Rastogi does not only have a remarkably deep sense of Abhinavan philosophy, but he also masters the matters of Kashmirian Śaiva traditions meticulously. He has reflected upon his understanding of Abhinava with an informed depth, and has thrown light on many aspects of Abhinavan research. Today, Abhinavan studies are progressing slowly, but critically. Students of Abhinavagupta all over the world are carefully looking at the scholarship being produced on him. He is easy to be loved, but difficult to be understood. Rastogi’s work is an erudite attempt to introduce and discuss some key features of Abhinavan studies. Abhinava is equally important for both the students of the Tāntirc literature and the poetic aesthetics. Rastogi, equally well versed in both these domains of Abhinavan epistemology, has discussed sections on both these topics in his book. The book begins with a discussion on the relationship between the Vedic and the Āgamic discourse followed by a historical assessment of the Kashmirian Śaiva systems, evaluation of its philosophical ideas and an analysis of how the contemporary scholars like Gopinath Kaviraj and others were influenced by such systems of thought or vice versa. As far as the stylistic features of the book are concerned, I think I should not hesitate from making some extremely important points. And these points should be understood as the criticism towards the publisher and not towards the author of the book. I say this because I also had a chance to have a look at the digital version of the press copy that Professor Rastogi had sent to the publishers. In his press copy Rastogi had put the elaborate notes and annotations as ‘footnotes’ and not as ‘end notes’. In my strong, but very candid opinion, I believe all those publishers who encourage the endnotes instead of footnotes, or compel the authors to do so in their books, should be completely abandoned. At least this should be done in Indological publications where we often have to use long notes and elaborate annotations and the publishers convert all these foot notes into end notes possibly because it deprives the main body of the book of its aesthetic looks. At least this is how an indological publisher justified himself while talking to me some years back. I am purposely emphasizing this point because as an indologist myself I am aware of the deep pain I have to go through searching for all those notes in a book flipping and flapping back and forth just because a publisher (who presumably never has to use the book for scholarly purposes himself) chose an option that could please his eyes. This is completely unacceptable to me, and I request all other indologists not to encourage publishers who may persuade them to convert all the footnotes in their books into end notes. This has been a grave problem with the books published in many prestigious series also and this book also suffers from the same problem. Another minor problem is the font used for the titles of the chapters which instead of being clear and catchy is sometimes deluding to eyes. The publisher should take the serious note of such suggestions. To conclude, I think, I am not at all a qualified person to review this book. However, I have done so at the request of Prof Rastogi himself. 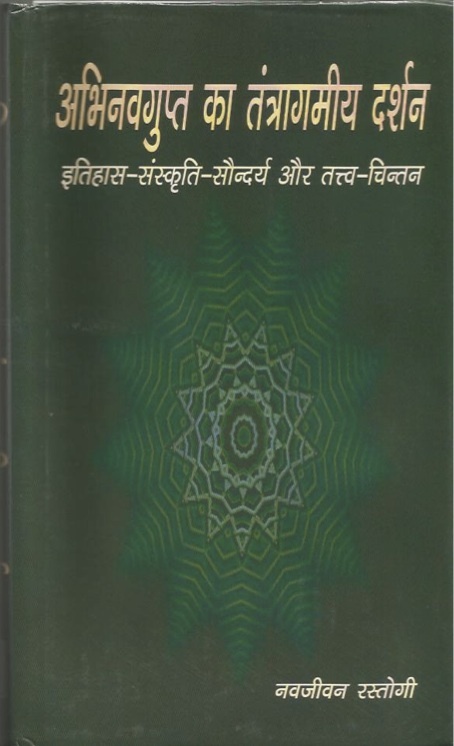 In Hindi, it is indeed rare to find such comprehensive essays of international quality on Kashmirian Śaiva philosophy. I will not try exploring for what reasons this book was written in Hindi, but I earnestly hope that Prof Rastogi’s works those he has chosen to write in Hindi, like this book, would also be translated into English in future. After all, how many people have studied Andre Padoux’s famous work “Vāc” in French, but several generations of the students of Kashmirian Śaiva systems have greatly benefited from its English translation. In the European context same is true about the theorists and philosophers like Foucault, Derrida, Kant, Sartre etc. This book should certainly become available in English.